(Zaman Al Wasl)- Zaman al-Wasl has obtained official information reveals how two Lebanese figures with Hezbollah ties have been looting Syrian antiquities,during and before the Syrian revolution erupted seven years ago. The investigative report shed the light on Ali and Hisham Aboutaam's trade life, relations with Hezbollah and the Assad family, in addition to possible links with Daesh. The story of the two Lebanese brothers reveals, in its appearance, an extraordinary success capable of arousing the curiosity and jealousy of those who seek wealth and fame, because of the exciting factors that have collected for these two brothers in their fifties the fortune and the glory of the human heritage in all its diversity, and with all its extraordinary splendor. But a number of ambiguous transactions precede the story of the brothers' success and many exclamation and interrogation marks follow it, and as much as the days reveal facts concerning these agreements, as much as the exclamation and interrogation marks surrounding the lives of the two men fall down. Most likely, it was not in the accounts of the Aboutaam brothers in taking this step, which was thwarted by Belgium, nor by supplementing the previous agreements concerning Syrian monuments that all they will reap will be thorns instead of flowers. After all what harvest a company working in the West could get if it is suspected of cooperation with ISIS, in the trade of the heritage of a stolen country, a trade which represents the financing of his "terrorist" activities. In the same context, one can draw a lesson from what happened regarding the Lafarge Cement company as Zaman al-Wasl was the first media outlet to reveal its oil business with Daesh". The first piece of information scrutinizes the identification of the Aboutaam brothers, and the presentation of a simplified account of what has been declared about them in the official Syrian documents preceding the Belgian case of about 16 years old. 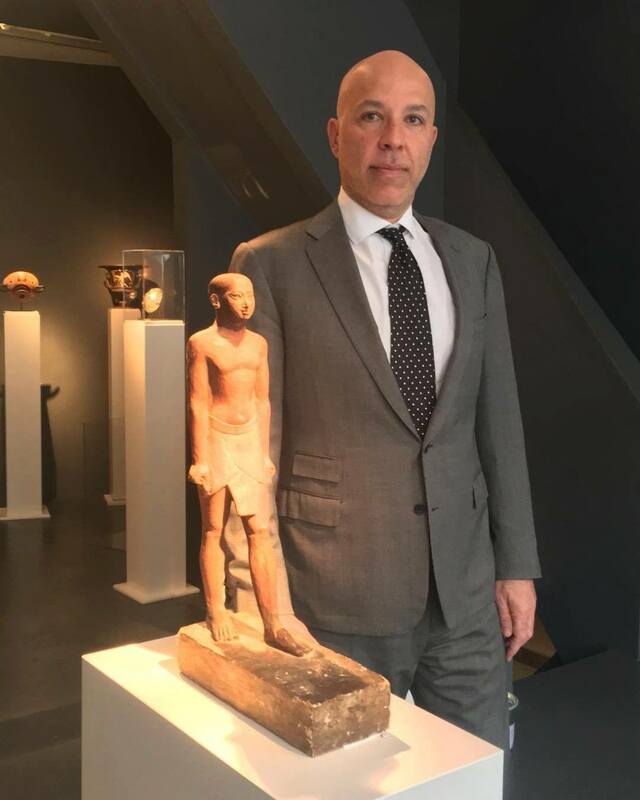 The documents reveal that in 1999 the investigating judge in economic security cases in Damascus issued a warrant for the Lebanese brothers after having a cargo of Syrian antiquities smuggled into Canada via Lebanon, in the name of and via Phoenix Ancient Art. The fact of the smuggling and seizure of Syrian antiquities in Canada is confirmed by correspondence from the Communication Division in Beirut (linked to the International Police / Interpol) dated 2000, which referred to the seizure of a lot of 53 archaeological objects smuggled from Tripoli to Canada in the name of "Abu Ta'am", 39 of which were confiscated. But was the fact that the artifacts were smuggled into Canada the first or the last page in Abu Ta'am's account, and is it necessary and feasible to verify documents dating back to 18 years? After Suleiman-Abu-Ta'am had accumulated wealth through trade with American ships arriving in Kuwait, the man returned to Beirut to establish what was his life's dream, his passion and his obsession. A company that collects archaeological treasures from the eastern markets which are open to chaos, and sells them to Western markets eager for history and floating on a huge amount of money. It was evident that Syria, rich with its heritage, was a focal point of Suleiman Aboutaam's activity, who worked to raise his two sons Ali and Hisham passionately to fill their lives and control their course. Since adolescence, they have become two fervent traders to the point that Ali - still a boy at the time - was able in the early 1980s (while the winds of the Lebanese war were turning in Lebanon and Syria), to win a commission of $ 15,000 on an antique market while on his way to school, he relied mainly on his father Solomon's "school" to seize opportunities. And as the father was perfectly aware of the value of the treasures, he was very generous in paying dearly for saving his most precious treasure, his eldest son, "Ali," who was kidnapped in Syria later for a period of approximately 10 days, his father was forced to pay half a million dollars in ransom to release him. That makes a huge amount of money on the abduction date scale (mid-1980s), which perhaps already refers to two things: the first is the father's appreciation to his eldest son and his commitment in the pursuit of his descendants carrying his glory and inheriting his fortune, the second is the magnitude of the influence and strength of the "gang" who kidnapped the son. To the extent that a merchant who controls the sum of millions and who no doubt has relations with senior officials of the Assad regime either politicians or intelligence members could not release his son "but was forced to pay a fee, which can also be a form of account liquidation. The school of Sulaiman did not stop at the borders of his company that he founded in Beirut but it soon turned to a "magnet" that attracts all the traders and antique dealers of Syria, Iraq, Turkey, Greece, Egypt etc. He learned well how to benefit from the free exchange he had practiced in Kuwait and he felt that the moment of applying what he has learned has come, but this time in Switzerland,, the global fortress of the most important funds, and the safest sanctuary for all those who like to market in expensive luxury products and extravagant things, ranging from diamonds and archaeological finds, up to wines and caviar. In Switzerland alone, there are 17 free zones which, until recently, represented a "paradise" for these big heads first from the point of view of taxation where the merchant does not pay a tax on his goods, no matter how many years it is stored, except when it spares them from warehouses and sells them, and secondly, in terms of ensuring the concealment of these "goods" from the eyes of "right holders" or those who watch their paths As will be later clear from the biography of "Abu Ta'am" with what is known as the mask of "double beauty". But let's quickly return to the relationship between the "Abu Ta'am" brothers and the Syrian heritage. as this is the core of our investigation and its main purpose. The author of the investigation noticed that this biography was transformed in the lapse of a few years: from the falsification of the certificate of Syrian origin, to the negation of the Syrian origin in all or in part. This means the two brothers' relationship with Syrian antiquities has turned 180 degrees, from pseudo-plagiarism to repudiation and total denial. Their obsession has become how to deny the Syrian character of the heritage of this country. Despite the fact that their main concern was rather to characterize as Syrian all that has no relation with Syria. There is no more appropriate explanation for clarifying what we have already stated and proving in practice, than recourse to the procedures of two trials in which Hisham Abu Ta'am was part. In the summer of 2017, Hisham challenged himself and filed a lawsuit against the US newspaper Dow Jones, owner of the Wall Street Journal, which published an investigation pointing fingers at the brothers, Abu Ta'am and their relationship to the purchase of artifacts looted from Syria by the Islamic State. " In paragraph 36 (pages 8 and 9), "Hisham" literally says: "The Wall Street Journal investigation has once again confirmed that the pieces (confiscated in Belgium in early 2016) are of Syrian origin and, as announced without attributing that the Belgian authorities are investigating whether the pieces were searched (extracts) at the outbreak of the war in Syria. In his response, Phoenix (led by Hisham Abu Ta’am) explained: it is not true that the implied things are of Syrian origin, one of them is Byzantine (of character) and can be originated-quite simply-from anywhere in the Byzantine Empire, and is more likely to come from Rome. This piece was presented at an auction in Paris in 2007 and was sold in another European auction in 2010. The second piece was the subject of a report by Art Loss Register (The leading institution in the documentation of lost artifacts), and this report shows that the loss of the peice was due to a period prior to the control of the Islamic State in the territory concerned (the site of Mary in the Syrian region of Abu Kamal). What is the secret behind this transformation, and how does the Syrian identity of any trace exchanged by the brothers, "Abu Ta'am", become a suspicion and an accusation that they try to deny by all means, although stamping Syrian identity on medium value items was the preferred method to collect about a million dollars as in one of the revealed transactions? There were probably similar agreements (in which Syrian identity was affixed to non-Syrian objects), but the eye of the investigators may not have mentioned them. Therefore, since Syrian antiquities before the war years were common to all those who wanted to trade them in the world market, it was very easy for the Abu Ta'am brothers as well as all other antique dealers to convince the eager customer through telling him: Sir, you have to be afraid of nothing, it is a Syrian antiquity !, After the outbreak of the war and the imposition of a severe embargo on the promotion of Syrian antiquities by the Security Council the phrase that best sound to the eager customer: Sir, don t be afraid. this unique piece is not at all from Syria, it has nothing to do with Syria. Although the allegation or escape of the Syrian identity of the trafficked objects is of a naive nature for the brothers, sometimes it helps them most often to evade criminal responsibility. Taking the case of the Iranian pottery that has already been mentioned (which was sold at around a million dollars) ended up in admitting being guilty and paying a fine of 5 thousand dollars .. Yes only 5 thousand dollars. and in the case of the two confiscated objects in Belgium since the beginning of 2016, Abu Ta'am has simply lodged a complaint against the one who accused him, and he continues his film in all naivety by saying that one of the two pieces are not Syrian, but Byzantine and from Rome, "probably", and that the other piece is looted from Syria, but not done by members of the Isalmic state. 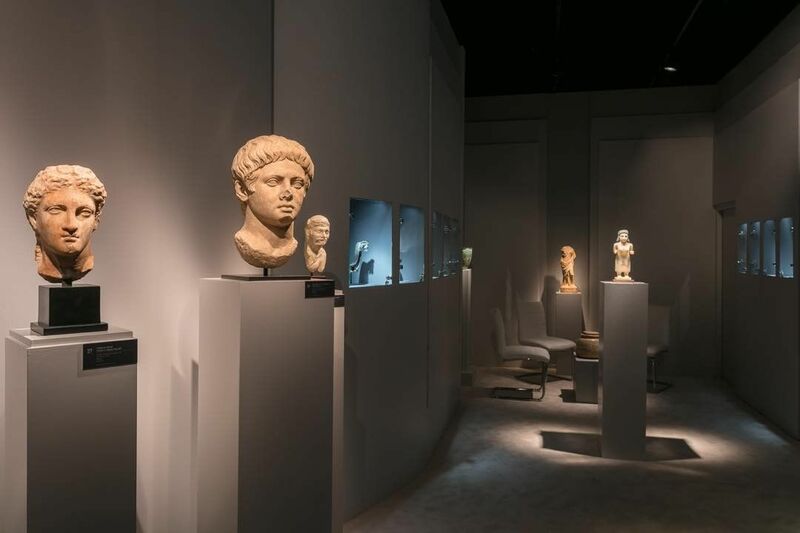 The question here for Aboutaam does not relate to proving the innocence of the trafficked antiques looted in Syria, as far as relates to evidence that it was not looted by Isil, and therefore the Lebanese brothers are not involved with the Islamic State organization. We do not know who can believe a claim like the one Hisham Aboutaam illustrated about the first piece. This man who owns an institution that speaks day and night of his accumulated experience in the world of antiques and artefacts and his recourse to eminent experts to confirm by testing and insight the originality of the pieces and their origins. This allows the brothers to give the buyer a solid guarantee that what he has purchased is genuine, not falsified, neither in his origin nor in his data. While Hisham says in his lawsuit against Dow Jones that the first piece confiscated in Belgium is "probably from Rome". Who can believe that?